As we enter our final few weeks of class, I encourage you think about your learning in the way that Joe Dillon so beautifully describes … did your hands get any less cold and sweaty as you got used to hitting the “submit” button on your blog? Were you able to find a way to balance your weekly findings with your need to get the laundry in and rest after a week of teaching? Have you made any new connections with students or colleagues that have propelled your thinking forward? These are essential learnings and it will look different for each and everyone of us. There is no one way. A key thing to remember are our objectives here at ED677: we have been connected learners in order to ground ourselves in what it means to teach in connected ways. We have also been working to critically examine what we are doing and why in order to support connected learning in social, participatory and equitable ways for all learners. And we’ve been learning new things through playing, creating and reflecting as a community of learners both within and outside of ED677. Embrace what you have learned and wondered about throughout this journey and use all of that to inform your final work ahead. This week (start this work this week for sure, but it may take us into next week, tbd) … I’d like to try something new; a Consultancy via Flipgrid! A structured process for helping an individual or a team think more expansively about a particular, concrete dilemma. Outside perspective is critical to this protocol working effectively; therefore, some of the participants in the group must be people who do not share the presenter’s specific dilemma at that time. When putting together a Consultancy group, be sure to include people with differing perspectives. The goal of this Make activity is to support each of you to get direct feedback on the project you are designing to take forward from ED677 that supports more connected learning and equity. We will use a customized Consultancy Protocol to support our process. Protocols are structured processes and guidelines to promote meaningful, efficient communication, problem solving, and learning. Protocols give time for active listening and reflection, and ensure that all voices in the group are heard and honored. Find a question that you can ask your classmates about your project to support more connected learning and equity. Develop a presentation of 5 minutes on Flipgrid that allows your classmates to hear your question while giving them enough context for them to respond to it. I have put you into small groups this week; respond to the others in your group and they will respond to you. Ready to try? See our ED677 Consultancy Protocol, Flipgrid Style! for all the details. And please note that your group members will be waiting for you to post your presentation. If you need more time, that’s fine — let me know and I can inform your group. 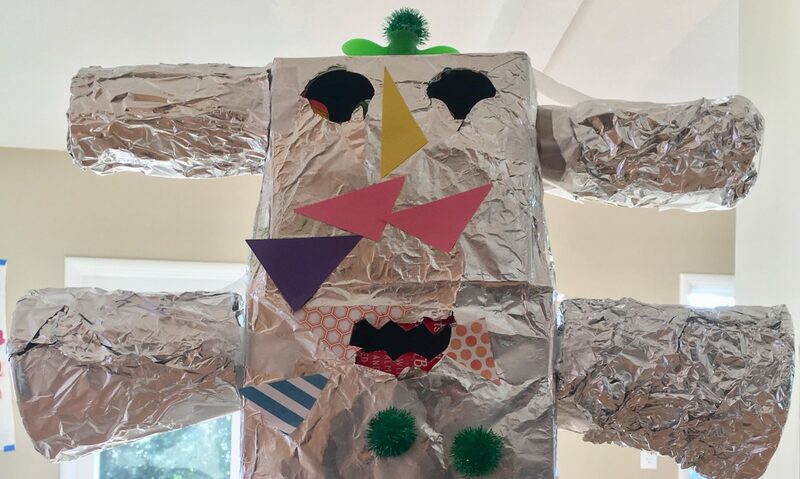 This week I encourage you to read this blog post that I wrote about the ongoing work of ED677 participants, Learning Together: Catching up on the adventures of connected learners and teachers via ED677. Then takes some time with this more recently published article by Lana Iskandarani – she is the Arabic teacher I mention above and this directly emerges from her project: Production-Centered Classroom Environment Increases Students’ Understanding and Interest in Learning Foreign Languages. My recommendation is to take some time this week to review the performance expectations from the syllabus, the questions for the self-assessment (below) and then jot notes to yourselves about your work in this course. Put that aside and continue to work on your consultancy and project. I’ll prompt you again next week to return to this, update your notes, and then get ready to submit it to me, with your final project during the final week. Note that these are the same assessment questions we stopped to work on mid-semester so please refer back to your notes then and also review your blog and all of the work you’ve done this semester to support this process. As I mentioned previously, after working online for awhile, I’ve done a process of Data Detox to make my online environment more healthy. Over the next few weeks, as we work to wrap up this online course, I share the link again if you want to try a few Data Detox exercises yourself if you are interested. Remember to that Mozilla provides resources and activities for thinking about a healthy Internet through supporting us all in being a bit more web literate. Reminder that we will be gathering online again this Tuesday April 16 at 7pm and we will have two teachers from the Central Bucks School District as guests — Amy Logue, QUEST teacher and Instructional Coach, from the Linden Elementary School and Robert Sidelinker, STEM teacher and staff technology coach at Warwick Elementary. They both took ED677 and excited to meet with you all. It has been difficult thinking of a final make idea. As a preschool teacher my final make has to be something age appropriate for a 2-3 year old classroom. I know most of my peers in this course are working with students much older with most likely a wider range of things that can be done within their classroom setting. I thought back on one of my inquiry questions which was, how can I effectively handle the child in the class that acts out more while also still making sure the rest of the children are still getting enough attention from me and getting the most out of the day’s lesson? I reflected a lot on why are some of my children act out (typically refusing to take part in an activity such as circle time). I thought more about why this is hard for them, because they are toddlers and they love to move! I have some children with ADHD and autism who have an especially hard time if they are expected to sit and control their bodies for any period of time and it is unfair of me if I don’t keep this in mind and try to accommodate them. I want my class to create sensory bottles together that we can keep in the classroom. Sensory bottles could be used at circle or any other activity that requires them to sit for a little. This can give them something to fidget with or something that can even help them to calm down when they are feeling out of control. It might also make the activity they don’t want to partake in seem more fun if they know they can use a sensory bottle if they need to. By making these together science will also be incorporated and I believe it will be an interest driven activity. Over the last couple of weeks, I have tossed around several different ideas of what I wanted to pursue as my final project. I narrowed down my choices to three that I thought would be worthwhile to explore with my students. Over the last couple of years I have worked to develop more authentic project based learning units into my class. These units have been connected to the curriculum through science and social studies. For my final make, I am going to design (or begin to outline and curate resources for ) a PBL unit on the solar system. We spend several weeks learning about the sun, moon and planets within our solar system, completing different experiments and hands-on activities. However, I would like to really dive deeply into this unit and create a PBL unit that puts students in the driver’s seat. Some of the dilemmas that I am trying to work out is identifying the size and scope of this project. There is a lot of material to be covered so narrowing and identifying the essential content will be important.Also, developing a strong driving question will be essential. This question will help guide our research and help students learn about the sun, moon, and solar system in an authentic way. In the past, developing PBL units has been incredibly time-consuming. I am excited that I can use this time now to plan for unit that my students can explore next year! An idea for my make: I would like to make a resource guide for educational advocates (staff support, parents, therapists) that can be used a reference, for ideas on how to incorporate the principles of connected learning in roles outside of the classroom. This idea stems from the questions that I posted in my inquiry blog. My inquiry questions were about me finding my place and role in Connected Learning process as it relates to the education of students. Throughout this course, I challenged myself to think about how I could implement the connected learning framework and principles in my role. I now feel that I am able to better identify the ways in which any person could support connected learning, regardless of how much interaction they have with students. Content for Reference Guide: I think that I would categorize my reference guide based on the principles and then provide examples of those principles using videos and readings that I have read in the blogs presented by Professor Cantrill and my classmates.I would start the reference guide with a definition of Connected Learning and then an explanation of why Connected Learning is necessary, and why it is important that connected learning be extended from the teacher to other advocates of education. Dilemmas: Am I any good at making guides? Which principles should I use? Should I chose a few or list them all? How should I make my make public? Print, digital or a presentation? How can I ensure that my blog is relevant to different education advocates? I want my reference guide to be inclusive but I do not want it to be too general. Suggestions from classmates: If my classmates would like to offer their input, I would like to know what they think could be useful for me to include in my reference guide, such as how many examples I should include for each principle, if I should have a specific target audience or to create a general reference document. This week I started with viewing the flip posts from my other classmates. One of my classmates performed a slideshow (which I wish I would’ve thought of!) and I also got to know a little more about the roles that my classmates have and how technology is used in their programs. I did not talk about about technology in my flip video. It was interesting hearing about the limits of technology that my classmate experience. As I listened I compared their experiences with my own. In my current role, technology is EVERYWHERE! It is used from the moment a person applies for our program, used in the classroom, used for test taking, used for grade recording and reporting. Another thing that I enjoyed hearing about was the different ideas that my classmates have about their small moves and connections. In my video I only mentioned making small moves within my immediate circle of co-workers, but after hearing from my classmates, I have more ideas on small moves that I could make, such as small moves with my Arcadia Professors, community members and leadership staff. This week I am also thinking about what I’ve been learning and the implications it may have on the students I support now and in the future. I think that studying topics such as equity, shared purpose and empathy has helped me to make a positive impact on the students and will continue to make a positive impact with future students. As a support staff, I have limited interactions with the students. So, I think that it is important the action I have with them is grounded with the principles of Connected Learning. I think that by incorporating the principles I am providing students an opportunity to truly connect with their education, their classmates and their community. The small moves I have been making include more communication with my faculty. As a team we have been increasing the frequency in which we actually speak to one another and not just through e-mails. The difference between now and January is noticeable. When I look back on my inquiry questions I think about how I have been wanting to make improvements in my own communication efforts. After reading through the blogs of my classmates and listening to their contributions, I feel more confident that I can take the first step (as a staff member) and begin that process of open communication within my department. Past, Present, and Future Scientific Self. Honestly I have been struggling at times to develop a great Final Project that I can use in my science class that incorporates all of what we have learned with Connected Learning and equity. My dilemma has been trying to tie science into connected learning ideas that would fit the students in my specific classroom. Many of my students are far below where they should be maturity wise. My goal is to connect science with their lives, community, and culture. I want them to simply realize how important science is to every day life. If my students can start to understand the value of science, perhaps it would spark some kind of interest in it. Any deep scientific thought would be great for some of my troublesome classes. I have gone back and forth on a few ideas and even bounced ideas off of my professor this week while slowly progressing toward my goal of settling on one final project. Some of my main inquiry questions this year for me have been, “How can I prepare students for their immediate and distant future while incorporating science in the process.” “How can I get kids motivated and inspired in the field of science?” “How can I get kids to realize that science is part of their every day life and culture since birth?” I reflected on these questions for a while and I came up with an idea I could implement in my classroom. It hit me as I was reflecting on my many project ideas. I realized how much reflection has helped me in this class and maybe the same could happen for my students. Maybe self reflection with a focus on science about their past and present can help them to the realize how important science is to everyone. Perhaps some meditation on how science will affect their futures would be a great way to get kids to think about science more than just a subject in school. For my final project I think I am going to have students reflect on their scientific past, and present, while also asking students to think about how science will affect their lives in the future. I would break down this writing assignment into a past, present, and future section. I am going to ask my students to write a page each for their past, present and future based on writing prompts that I will provide. (you will see below.) On the back of each page, I will ask students to draw a version of themselves involving some kind of scientific concept for each time period. I am still kicking around some ideas for this activity but the whole point is to get kids thinking about science in ways they might not have without being prompted to. Hopefully they will realize how much science is in each of their lives as they reflect. These are the questions I am thinking abut asking my students for each of the three periods of time. Looking back now, how has science affected your culture and life growing up? What scientific concepts did you love as a little kid? Did you have any interest in science when you were much younger? Explain Why or why not. Draw yourself and how science has affected your past as a child in one way. How have your feelings about science changed in present day? How does science affect your daily life now? What were your favorite concepts in science class this school year? What do you love about science currently? What is your favorite field within science? How can you currently make a positive impact in your community using science? Draw yourself in a present day situation where you are affected by science concept. If you had to choose a career in science, what would it be and why? What fields of sciences will continue to grow in importance in the future? How can you make positive changes to your community in the future using science? How do you think science will impact your daily life in the future? Think about the very distant and not so distant future. It is definitely a work in progress, given my 7th grade students level of achievement this school year, but at least I have a concrete direction for my final make of the year. My first-ever attempt at making a “zine”! Look below for a video explaining my thought process and some pictures of the zine. Video describing why I made the zine and giving a bit of information about my final make. I tweeted our our presentation; whoo hoo! Where else should we share? Feel free to pass it around (Note that I made a public version of it in case we still wanted to use the original between us). With your own learning as the first focus, take this week to reflect back on what you have been working on this semester. Reread your blog. Visit the blogs of your classmates. Look at the things that you made — from blog posts, maps, to annotations. With the learning of your colleagues as part of our shared purpose too, take this week to spend some time with our shared Presentation and connected teaching flipgrid. What are the small moves you made along the way? What about your classmates? What are some of the big ways they supported you in being a connected learner this semester? What have the implications been for you as a teacher? And now, with learners as your focus, turn your attention to the implications for them on what we’ve been doing together this semester; what is important about it and why? Ask them to be part of this reflection if you can. If you don’t currently have learners you are working with, what do you see as the implications for your learners-of-the-future? After all this, start to think about your final “Make” for the semester. Final “makes” should be something that you design that supports you in building towards equity and connected learning beyond this course. Blog this week about the make you are thinking about and list a few dilemmas that come up as you think about how to best design for connected learning and equity in your context. And then, as you read the blogs of others in your class, think about a question you might want some feedback on from your classmates (we will have a chance to dive more into these question next week). Kind of getting tired of blogging? Another way to share ideas is by making a Zine! It’s super easy and gives you 8 panels on which to share your plans. See how to make a Zine here: https://www.wikihow.com/Make-a-Zine … and use it to do the same thing – ie. start to described the make you are thinking about and list a few dilemmas that come up as you think about how to best design for connected learning and equity in your context. Read the concluding chapter of Educating for Empathy (pages 102-110) which brings a focus on putting empathy into action on the personal, professional and civic levels. Let’s continue to think think together about how we can build our own supports and networks for this work. Then join these colleagues from three (actually four, if you include the NWP) teacher leadership development organizations in order to explore key questions about teacher leadership: What is it? How is it fostered? And what good does it do in the world? Beyond the potential partners you named this past week, Nicole also recommends finding others who are doing this work in national and community-based professional organizations and via networks on social media. Maybe of you are already thinking in this direction! Let’s continue this line of thought with two Philadelphia educators who have also been working on this, including Arcadia’s Kira Baker-Doyle. Kira’s recent work on transformative teachers traces many of the connections teachers are making both locally and digitally (Start around 9:00 to skip the way-too-long intro. Oy.). And a late addition here, but if you are interested I invite you to participate in this month’s Marginal Syllabus reading Cultivating Urban Literacies on Chicago’s South Side through a Pedagogy of Spatial Justice. Also this was a great related conversation with middle school teacher (now professor) Kara Taylor and her co-authors. Find ways to make some of the connections you thought about this past week; no need to blog about them. Just use the time you’d usually use searching to start to make some of those small moves and connections. If you wish to share feel free; either way though, keep notes for yourself as you can use these when building your final project. We won’t gather this week, but we will get together next Tuesday, April 16 at 7pm. Also, don’t miss last week’s hangout where we talked a bit about our final Make projects and looked at projects by former ED677ers. 1. Here is a great article about Empathy in the classroom and y it is so important to care about your children. 3. Connected learning With emotions is an article that talks about how to script in emotions while lesson planning. That adding emotions adds a new layer to lessons and makes them more memorable. 4. Empathy is extremely important when building a school and community. This article https://mcc.gse.harvard.edu/resources-for-educators/how-build-empathy-strengthen-school-community talks about how empathy is a huge part into todays society and how is is a key to strengthen school communities. 5. https://www.habitsforwellbeing.com/3-ways-build-empathy/ is a great sight to find three great ways to build empathy in your classroom. 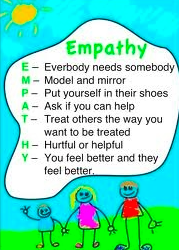 6. https://www.flocabulary.com/unit/building-empathy/ this is a great site for all teachers to show their students on empathy building.